We’ve been learning more about the ‘home’ of new Prius; the Tsutsumi factory in Japan where it’s built. We’re fascinated by the lengths management and staff go to make it a showcase for environmental best practice. It answers a lot of the criticism that has been directed at Toyota’s hybrid car over the years; that it may be a cleaner car to drive, but that it’s ‘dirtier’ to make than a regular petrol or diesel model. 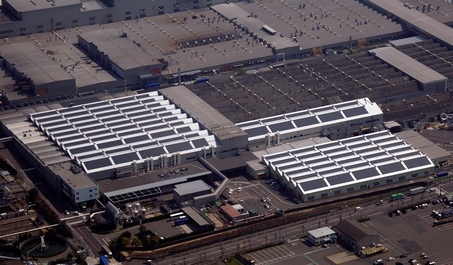 Tsutsumi is one of five Toyota Eco-Factories around the world that pioneer clean operations and the use of renewable energy sources. Burnaston in the UK, home of Avensis, is another. The concept is that these plants will establish new ways of working that other factories can adopt in the future. Solar power is one of Tsutsumi’s big features, with 50,000 square metres of panels generating up to 2,000 kW of energy an hour. That’s enough to meet half the site’s total electricity requirements – equivalent to the power used by 500 homes – with the rest sourced from a highly efficient gas co-generation system. Every effort is made to ensure none of this power is wasted: energy-saving lighting is used and sunlight ducts have been designed into the buildings so that natural light can be exploited where possible. There are even regular staff energy patrols, and a control system cuts the level of electricity used when the plant is not in production. Toyota’s Eco-Factory ethos is not just about its performance in manufacturing, but also its relationship with local people and the environment. Much of the assembly plant is covered in photocatalytic paint, which reacts to sunlight by releasing active oxygen into the atmosphere, helping break down harmful substances in the air. Employees also joined with local people to plant 50,000 trees around the factory site last year. When it comes to the figures, the Eco-Factory concept is paying off. Tsutsumi sends no waste to landfill and since 1999 the amount that is incinerated has been cut by 82%, to 730 tonnes. The aim is to cut this figure to zero, too. Between 2003 and 2007, CO2 emissions were reduced by 36% and the total amount of waste produced fell by 21%. Water usage fell by 14% during the same period, and a stringent recycling system has halved the amount discharged into local rivers; what’s more, the water that is released from the plant is actually cleaner than the waterways it flows into. Perhaps we ought to drink to that? Very impressive numbers at the Tsutsumi plant (zero waste to landfill, -14& water usage etc), does Toyota handle all these environmental technologies in-house or do you rely on suppliers and third party specialists ? Thanks for your answers. I am passionate about the subject. Good to read your post as this subject, it is close to our heart as well. An interesting question. The vast majority of changes that we make environmentally will all be in-house as it down to thinking about how we can work smarter and what we can do to reduce waste and energy usage. A good example of this is our UK manufacturing plant which is one of Toyota’s five sustainable plants across the globe. It was the first UK automotive plant to be awarded IS0 14001 in 1996 for environmental management, zero waste to landfill back in 2002 plus many other initiatives through the decade. More information about the plant can be found here. http://bit.ly/1aFHIsO. Where we do seek third party advice, it will be in specific areas such as the large solar array that was built at our UK plant or even local planting advice for our own building here being turned into an Eco HQ. Hope this has helped answer but let us know if you have any more questions. No problem, I just needed to make sure I was understanding you correctly. Actually I’m looking for information on the photovoltaic installed power (kW) on each of those plants and the predicted energy production per year (kWh). I have quite a lot of detail on the UK plant, enough detail on the Japan and US plants, but no information whatsoever on the thin film cover at France nor about the office building PV over Ban Ho. Feel free to send me an email directly if you don’t want to post about this in the blog. There is a European report along with a global one. We also have the website http://www.toyota-global.com/ incase you are not aware of this which contains a lot of infroation regarding our environmental initiatives. Now you lost me David. The article you wrote initially says “Tsutsumi is one of five Toyota Eco-Factories around the world”, and now you take Tsutumi out of the list and give me a list of only 4 plants? Do you mean these other 4 make together with Tsutsumi the 5 global plants list? Tsutumi plant should have been added to the list making five. How many “eco-plants” do we have today? Can you please confirm or revise the list above for me? Not bad but are the Prius’s CO2 emissions from manufacturing now lower than other cars? Or perhaps lower than 10years worth of use of a Prius compared with the manufacture and running costs of a non-hybrid with similar performance? Somehow I doubt this as the prius’s batteries produce a lot of CO2 to manufacture, plus the emissions from building the rest of the car…even with the eco-friendly manufacturing plant taken into consideration. I’d love to know how they process the batteries to reduce the CO2 emissions from manufacturing them. It looks like the actual building of the car has been taken into consideration…but what about the parts made externally to that site? I can send you a document which was produced back in 2009 which you may find interesting and useful and hopefully will go someway to answer your question. I’ll send it to the email address you provided when you posted.